Best part: Russell Crowe’s intimidating performance. Worst part: Its ham-fisted messages. Many people, in some way or another, were hit by the global financial crisis. A few years have passed, and Hollywood has since made a stack of films focusing on this hot button issue. Broken City avoids the bombastic nature of many post- economic crisis action/crime flicks to deliver a subtle and old-fashioned crime-thriller. It’s a dark and gritty film noir that reminded me of what Hollywood used to be. Sure, it has its drawbacks, but I was still able to grab onto this engaging story. 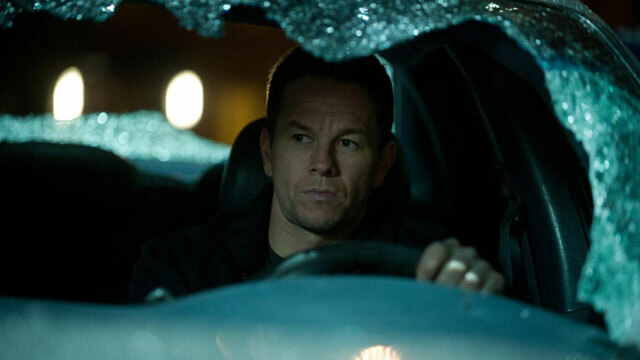 Detective Billy Taggart (Mark Wahlberg) is arrested and tried for the alleged murder of a young black man. He is released from his shackles after a controversial hearing. His victory, however, is short lived. The mayor, Nicholas Hostetler (Russell Crowe), and Taggart’s superior, Capt. Carl Fairbanks (Jeffery Wright), persuade Taggart to quit the force. Seven years later, Taggart is running a small business as a private investigator. Running out of money (despite his forceful nature), he pushes himself to take an assignment given to him by Hostetler. Hostetler believes that his wife, Cathleen Hostetler (Catherine Zeta-Jones), is cheating on him. Afraid that her debauchery might affect his upcoming re-election campaign, Hostetler asks Taggart to tail her. From that point on, multiple threads intertwine as Taggart gets into one bad situation after another. Despite some juicy plot developments in the film’s second half, it’s still a by-the-numbers crime -thriller. The film lacks a sense of urgency and style. Every so often, the slow pacing would dull the film down to an extraneous extent. I don’t think it should’ve been a mindless action flick, but it needed a little less conversation. Having said that, it’s a narrative that is easy to connect with and enjoy. It may be typical on many levels, but sometimes that is a good thing. It, however, is still not as smart as it thinks it is. At points, it feels like the director and screenwriter are hammering nails into your head. Over and over again, we are reminded of how scummy politicians, cops and ‘one percenters’ can be. The use of symbolism and metaphor isn’t subtle in any way. It’s a film that lambasts how New York City has evolved over the past decade. The rich look down on the poor, race relations are at an all-time low, and people are too afraid to help one another. It discusses these issues without acknowledging Rudolph Giuliani’s beneficial time in office. Brian Tucker’s script falters on many levels. This is a formulaic thriller that lives on the strength of its cast and director. This is Allen Hughes’ first directorial effort by himself. He and his brother, Albert, have directed many influential action/thrillers together since their debut feature Menace II Society. He pushes every plot twist and turn on the audience without excessive force. Despite the film’s slow pace, Broken City is terrifically tense and punchy at points. The problem with the direction, however, is that Hughes focuses too much on the messages without giving the film a sense of style. The Hughes brothers have created kinetic visuals for many of their movies. From Hell placed us into a shiny Victorian-era London at the time of Jack the Ripper. Meanwhile, The Book of Eli, despite its flaws, had a sumptuous post- apocalyptic visual sensibility. 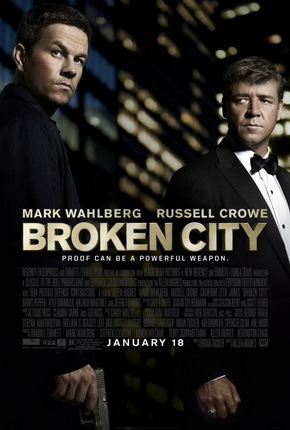 Broken City is nothing but, for all intents and purposes, a very moody thriller. Whereas Gangster Squad heightened its visual style to a cartoonish extent, this film doesn’t push it far enough. Some of the costumes and hairstyles give the film a nuanced 70s look, but these stylistic elements are very slight. “There are some wars you fight and some wars you walk away from. 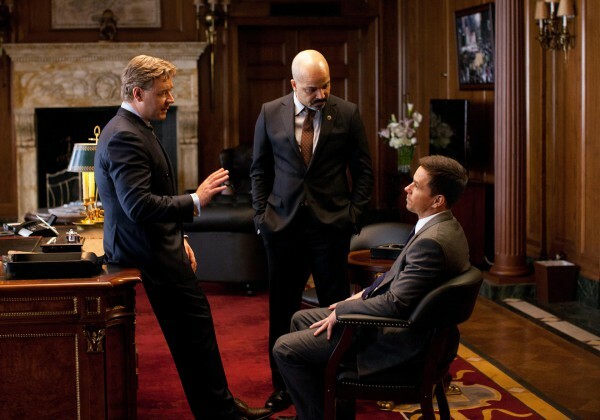 This isn’t the fighting kind.” (Mayor Hostetler (Russell Crowe), Broken City). Wahlberg, Crowe & Jeffery Wright. This film is very enjoyable, particularly if you are interested in film noir. If you look closely, you can spot elements of many influential crime films such as L.A. Confidential, Klute, and Chinatown. It contains many film noir clichés, yet it leaves the trench coats, fedoras and cigarettes behind. It relies, to a certain extent, on the strength of its characters and performances. Wahlberg plays the down-on-his-luck lead character. He is an old-school private eye and a brutish male with several understandable weaknesses. Women and alcohol are continually waved in front of him. The banter between him and his cute blonde assistant is funnier than you think it would be. They embody small business owners hit by the troubling economic situation. Wahlberg has made many hits (The Italian Job, The Departed) and stinkers (The Happening, Max Payne). Not only does he play cops or criminals in most of his movies, but he plays all of them with the same intensity and range. He is still a charismatic on-screen presence. He brings toughness to this already intriguing role. Russell Crowe steals every scene he’s in as the slimy and vindictive mayor. Zeta-Jones, however, is under-utilised as NYC’s scheming first lady. 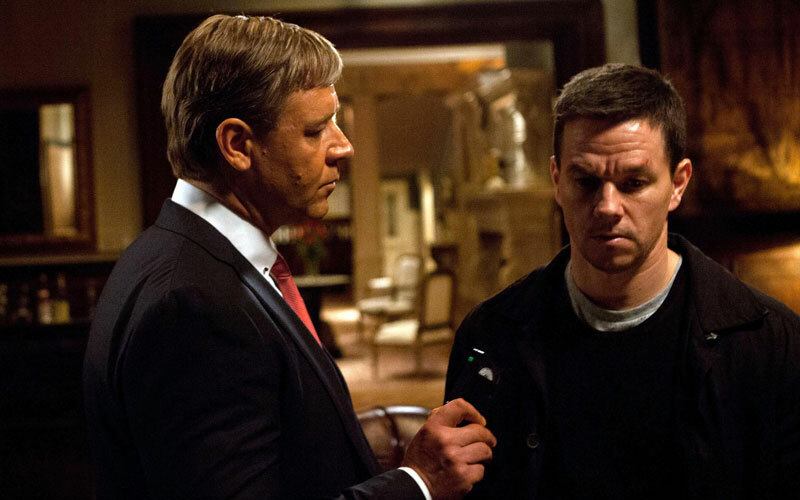 Broken City suffers from a lack of originality and style. Despite this, it’s a subtle and likeable take on a classic film noir story. The cast and director pull a rabbit out of a hat; creating an enjoyable, witty and intensifying crime-thriller. Thanks to Wahlberg and Hughes’ collaboration, Broken City scrapes by on being pure, unadulterated comfort food cinema. Verdict: An enjoyable yet problematic crime-thriller.